"In my voice, your voice, a woman's voice I expand another prayer... My voice rises and cries out to Heaven... In my voice, in a woman's voice, is prayer." 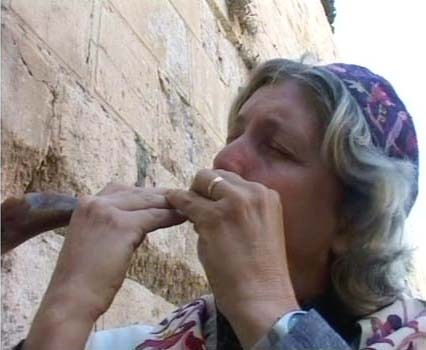 This soulful morning prayer is rendered to a crescendo at the Western Wall in Jerusalem by a group of women - known as the Women of the Wall (WOW). Yet, despite a passionate rendition, they are accused of breaking the law by the ultra orthodox rabbinate, which has declared the Western Wall a religious space subject to orthodox law and custom. According to Jewish laws women are forbidden to sing, wear prayer shawls, read the Torah or pray aloud even in the women's section of the Wall. In defiance to this discriminating rule, WOW was formed in 1998 when a group of Israeli and American men and women, who were present in the city for a feminist conference, spontaneously decided to pray together at the Western Wall (Kotel). A remnant of the wall surrounding the Jewish Temple in Jerusalem that was destroyed by the Romans 2,000 years ago, the Western Wall became a symbol of the Jewish people's longing for Jerusalem. In 1967, it became part of Israel. Since then there has been a public debate over to whom the wall belongs. "The Prime Minster had a choice either to give it to the archaeologists or the rabbis. He gave it to the rabbis," says filmmaker Prof. Yael Katzir, who has directed the award-winning 'Praying in Their Own Voice', a film about WOW. Said to present "an Israeli perspective on democracy, Israeli-ness and Judaism", 'Praying in...' was recently screened in India at the International Festival of Tribal Arts and Culture by Indian Infotainment Media Corporation and Vanya Prakashan, Tribal Welfare Department, Madhya Pradesh. Katzir, who is in her mid-sixties and Head of Communal Cable TV in Beit Berl College, Tel Aviv, was present at the festival. "The Wall is a cultural and national symbol of unity but the ultra orthodox rabbinate made it like a synagogue. They want to impose their orthodoxy on all Jews. For me, it is unacceptable that women are not allowed to read from the Torah. It became extremely important for me to become a voice through my film," said Katzir. The film introduces a group of women belonging to all streams of Judaism - orthodox, Reform and Conservative - who want to worship and have a share in Jewish ritual and the state of Israel. Ironically, unlike in Jewish communities in the rest of the world, women in Israel are being exiled. "The Torah is my connection as an Israeli and Jewish woman to the most primal source of my identity. If I can't read from the Torah scroll as a woman, then no one has the right to read it," says Peggy Cidor, a journalist and member of WOW, to the camera. Katzir captures an emotive Cidor as she adds, "The Torah doesn't belong to the group but to everyone. We women were there when the Torah was given at Sinai. We were part of it. So we are fighting for the basic rights to recite the morning prayers." However, Katzir, who is committed to the idea of inclusivity, brings in the voices of those who oppose the WOW. "The Torah gives you no right, you have nothing at all. Those who violate the Torah rules goes to hell," says MP Rabi Nissim Zeev, Shaas Political Party. The film makes an emphatic statement when it starts with various groups of people praying at the Western Wall, the celebration on Jerusalem day, Official Memorial Day Ceremony, The Ninth Day of Av and most importantly swearing in ceremony for Paratroopers. "I have purposely done that," shared Katzir, "The Wall is a public space. Yet, it is here that women's voices are silenced. While the ultra orthodox are trying to combine religion and state in the name of unity, women are fighting to combine religion with feminism." In the film, the WOW raise a significant point when they say, "Israel markets the Western Wall as a place of National Unity. How can there be unity if bullies control the Wall?" It is with this plea that the WOW went to the Supreme Court. The judges delivered their first judgment in 2002: the group's prayers were in accordance with the Jewish Law. However, a consequent nationwide outcry led to the Supreme Court appointing nine judges to reconsider the petition. The film captures the journey of the WOW over a two-year period - from the time of the second judgment delivered by the nine judges in 2003, according to which the WOW were to be given an alternate site called Robinson's Arch, a few levels lower than the main praying site. Reacting to this, women say, "We have been excluded and exiled. The State and the Supreme Court have surrendered to fundamentalist demands under government pressure, ignoring streams that demand equality within religion." The film includes candid responses of a wide variety of people. Abraham Porez, former Minister of the Interior, and MP of the Shinui Political Party, admits that the ultra orthodox have taken over many of the holy sites. "They control them as if they own them," he says. Comments Rabbi Gilead Kariv, legal attorney and a leader of Israel Reform Movement, "Their fight is one of the bravest regarding relations between religion and the state in Israel. This fight has so much to do with exclusion - exclusion of non-orthodox groups from Judaism." "On the surface, Israel is a democratic country. But in the political arena, the religious parties, which constitute only 10 to 15 per cent, look forward to any coalition. With every political coalition they get plenty of rights that are not legitimately theirs. In the process, they take control," explained Katzir at Indore, the venue of the festival. Katzir lead the audience through time and space to juxtapose arguments of those who affirmed women's rights and those who felt "their action is provocative and politically motivated". Without intervening at any point so as not to mislead the viewer, Katzir raised important questions related to a woman's personal, communal and public identity and who defines and controls that. The film ends with women blowing the Ram's horn or the 'shofar' and singing, 'Let me hear your voice, for your voice is sweet and your face is beautiful'. While Israel is the milieu of the film, its concept transcends international borders. For the film throws light on how women negotiate the conflict between two struggles: the formation of a state - usually on the basis of a separate identity and ethnicity or religion; and the fight for freedom - within a religion. Katzir's production is a tool that helps understand and challenge the politics of exclusion.